17 Women from various barangays of Tuguegarao acquired livelihood skills training in Home Care products making. This springs to the growing number of experienced women entrepreneurs in the City. CSU-Gender and Development Office lead by Dr. Jocelyn D. Tuscano, University GAD Focal Person, gathered women in the city and extended entrepreneurial skills training at Centro 02, Tuguegarao City, Cagayan on Tuesday, March 13, 2018 in line with the celebration of the National Womenâ€™s Month. The annual conduct of the livelihood skills training aims to uplift the lives of those who belong to the marginalized sectors of the society especially the women and provide them necessary knowledge and experience. 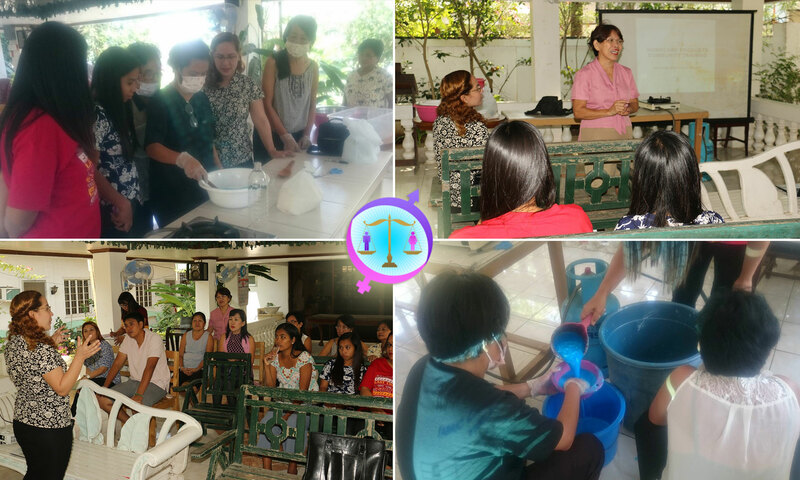 Prof. Jinky Marie T. Chua of CSU-College of Allied Health Sciences (CAHS) shared her expertise in the production of Home Care Products during the said livelihood skills training. She introduced the materials needed for the production of Dishwashing Liquid, Fabric Conditioner and Carwash Shampoo and soon demonstrated the procedure on how to make each of the products. Towards the end of the training, all the participants were able to produce number of bottles of Dishwashing Liquid, Fabric Conditioner and Carwash Shampoo. With this, CSU is hopeful that they will carry with them the knowledge and experience they attained from the said training. Truly, empowered women empower women.